Septum piercings are one of many piercings that we offer here at Mantra Tattoo. They are one of the only piercings on your body that can be concealed by flipping them up into your nose! Septum piercings go in a very unique spot in your nose and decorate the bottom of your septum. We have tons of different options for jewelry for this particular piercing. 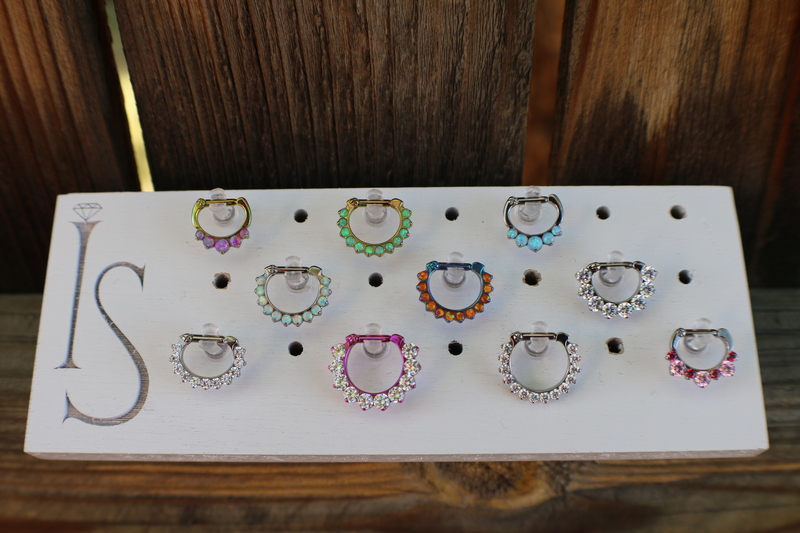 Peircers are here every day of the week to help you with any of your piercing questions or to create and customize a special piece of jewelry just for you! Stop by the shop and check out all we have to offer! Here at Mantra Tattoo we stock only the highest quality jewelry available. Giving you unlimited options for customization and selection. 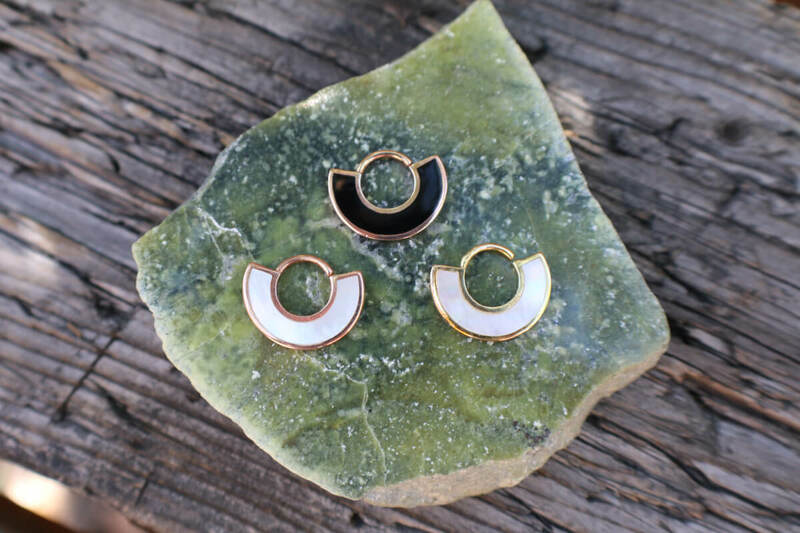 There are several types of jewelry that can be used for a fresh septum piercing, so don’t worry! You aren’t limited to a “retainer” or some basic piece of jewelry for your new piercing. We can use horseshoes, full captive hoops, and even clickers as long as your anatomy allows it. 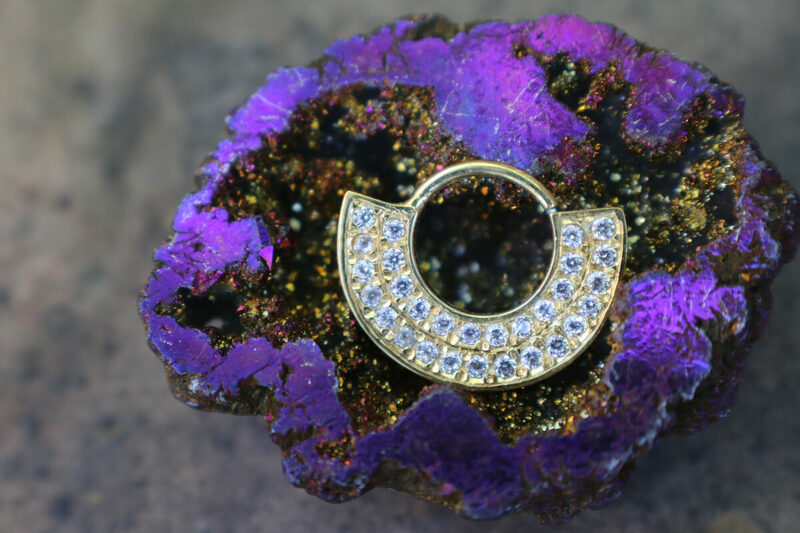 We can also anodize the jewelry to change the color of the metal and we can add clusters with CZ’s or opal stones or captive beads made of Opals and other synthetic stones to compliment the captive hoop or horseshoe to give you a much more custom look! We also offer 14k gold pieces that are decorated with CZ’s or different kinds of stones. 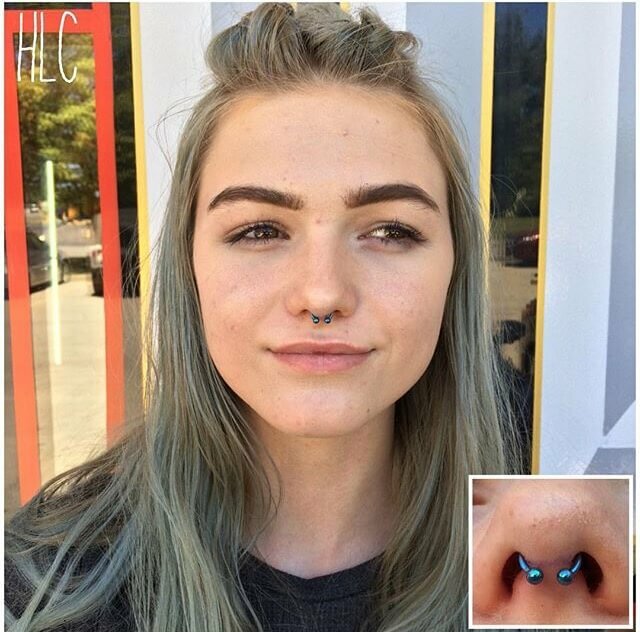 Septum peircings are generally one of the easier piercings to heal and take care of as they are located in a more protected area inside of your nose. The piercing is done and usually placed in a “sweet spot” located between the layers of cartilage in the center of your nose. This piercing is typically not one that is through the cartilage but is anatomy dependent. You want to avoid touching, spinning, or playing with your jewelry at all costs. If you must flip your jewelry up into your nose while still in the healing process make sure that your hands are clean! We recommend cleaning twice a day with a saline salt water wound washing solution which can be purchased here at the shop. Be sure not to over clean your piercing as that can also aggravate it more! Warm saline compresses can also be performed a couple times a week by heating up saline solution in a shot glass and dunking a clean/sterile piece of gauze or paper towel into it and holding it on your piercing for a few minutes. This will help the fluid flow through your piercing and assist in healing. The main thing is to just let your body run its natural course of healing, everyone is different. If you have any questions or concerns make sure to contact your piercer first before consulting the internet or other sources.